Well yes, everything gets harder as we age, and this wears us down. No wonder that a usual component of aging is asking, “Where are we going and why are we in this handbasket?” and then providing the obvious answer. Alas, this is all too often accompanied by an increase in irascibility to the point of such irrational behavior that when we really need friends, we drive away our former dear ones. One of my best friendships goes back to the late seventies when i was new in San Francisco and met a delightful woman with whom i immediately clicked. The friendship gradually grew closer as we aged and finally found ourselves living alone, so even though she now lives in a nearby city, we’ve been enjoying visiting each other frequently. She’s introduced me to several of her neighbors, all of whom i’ve found delightful, particularly a frail older couple who gave me fruit from their trees while i gave them jams and jellies i’d made. So i was saddened in June when i learned that my friend was angry with the old couple. When i was up there in July i asked my friend for their house number so i could drop them off some jam, they having had some serious medical problems. However, my friend refused, saying she didn’t want me to contact them. I thought this was ridiculous. Yes, when we were children and had arguments with playmates we quite naturally wanted our other playmates to stop playing with the offenders. But at some point we matured and realized that trying to restrict our friends’ relations with others was not a part of real friendship. So i told my friend that it was just fine for her be angry with the old couple, but that since they had done nothing wrong to me, it was best that she and i not discuss them any more. And that was that…i thought. Then in August i wanted to take a load of lumber up to a different neighbor of my friend’s and arranged to take her to lunch after i’d dropped off the lumber. So i drove up there, but before i delivered the lumber i figured out which house the old couple lived in and stopped there briefly to give them a jar of blackberry jelly. Afterwards, i went to my friend’s house to take her to lunch. But when she answered the door, she looked distraught. And revealed why when her first words were a demand to know whether i’d had “any contact” with the old couple. I don’t think fast enough anymore. What i should have realized from her look was that she’d been stewing for a month over whether i might extend some kindness to a sick old couple with whom she was angry, so i should have simply told her no. Alas, i told her i’d given ’em a jar of jelly. Which sent her into a screaming rage at my disloyalty, and when i couldn’t calm her down i just suggested that when she felt like my taking her to lunch, she should let me know. That was August. And yes, after the furor of the holidays is over, i’ll write her and extend a fresh invitation to lunch. I find myself increasingly cranky as i age, having to work at not expressing my negative feelings, and i’ve adopted some mechanisms that have been, i think, largely successful in keeping myself on an even keel. At least so far. What i want to make sure i don’t do is drive my friends off…or try to govern to whom they give jars of jelly. 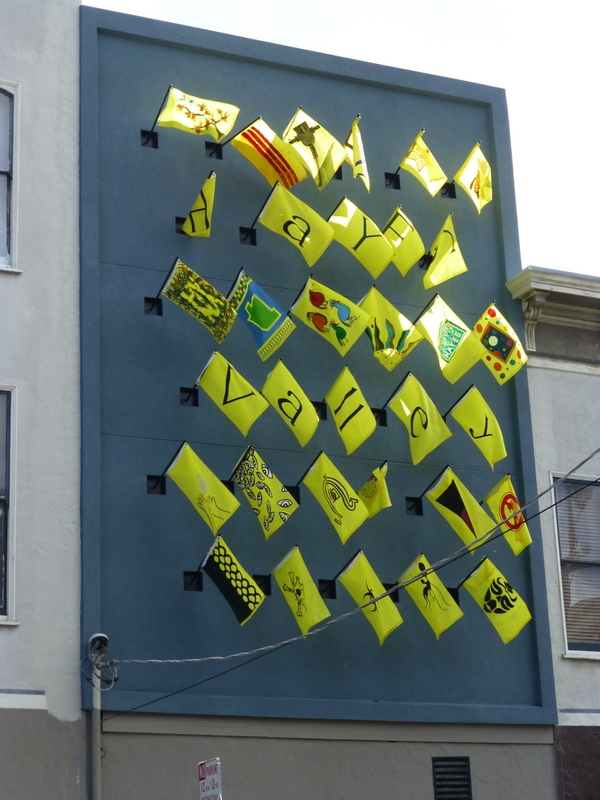 No appropriate pic for today, so here’s a shot of some Hayes Valley flags.